When you think about 'company image', you probably think in terms of how the company is marketed, the quality of the product or service on offer, and the general perceptions held by existing and potential customers. Rarely is thought given to business writing. At WhiteSmoke, we think that the communication revolution taking place through the widespread use of electronic communication has created a new avenue through which to think about company image - the business email. It is an established fact that emails are full of errors in English grammar, punctuation and spelling. Yet, many businesses rely heavily on email to communicate with their existing and potential customer base, as well as partners and traders. 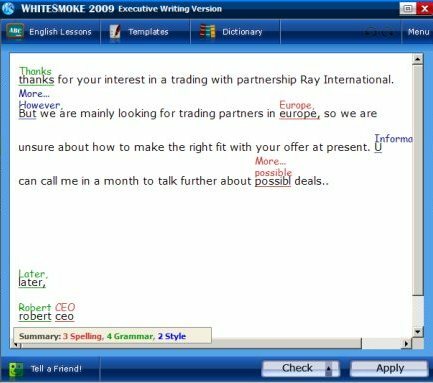 WhiteSmoke Writing Software remedies this problem by offering a grammar checker, a spelling checker, a thesaurus and dictionary in a practical interface that integrates seamlessly with your email software. thanks for your interest in a trading with partnership Ray International. But we are mainly looking for trading partners in europe, so we are unsure about how to make the right fit with your offer at present. U can call me in a month to talk further about possibl deals..
To fix this email message, we'll run WhiteSmoke and take its suggestions for the text, and also make some small hand edits. Thank you for your interest in a trading with partnership Ray International. However, we are mainly looking for trading partners in Europe, so we are unsure about how to make the right fit with your offer at present. You can call me in a month to talk further about possible deals. What we have now is a text with correct grammar and an appropriate writing style, presenting the company as the professional and efficient organization that it is - a company worth doing business with. While informal and even incorrect English maybe acceptable or 'creative' in a quick email between friends, it can look embarrassing when applied in a business context. Online communication at work has somewhat blurred the lines between formal and informal writing. However, as the example above shows, in some contexts this blurring of boundaries could have disastorous results. Enter WhiteSmoke.